When hair is damaged, though, the scales may separate and hair can become dry. Because the scales on dry hair don't protect the inner two layers as well, hair can break and look dull. The type of hair a person has — whether it's straight or curly — can also affect how shiny it is. Sebum, which is the natural oil on the hair, covers straight hair better than curly hair, which is why straight hair can appear shinier. Depending how long a person's hair is or how fast it grows, the end of each hair shaft can be a couple of years old. So the hair at the end of the shaft could have survived a few summers of scorching sun and saltwater and winters of cold, dry air. How well you care for your hair from the time it emerges from the root plays a role in how healthy it looks. Your hair type. People with dry, curly hair have different hair care needs than people with straight, fine hair. But all hair needs to be treated gently, especially when it's wet. Wet hair can stretch, making it more vulnerable to breakage or cuticle damage. That's why using a hot blow-dryer (or other heat styling products) on very wet hair can damage it. Long, high heat causes bubbles to form in the hair shaft, which causes them to break easily. Some people find that their hair gets oily in their teen years. That's because the hair follicles contain sebaceous glands that make sebum, which moisturizes the hair and skin. During adolescence, the sebaceous glands may become overactive due to hormone changes during puberty, producing more oil than needed. As with acne, oily hair is usually a temporary part of puberty. Many teens care for oily hair by washing it once a day — or more if they're active. As long as you treat your hair gently when it's wet, frequent washing shouldn't harm it. If you have acne, it's a good idea to keep the hair around your face clean so hair oils don't clog your pores. If you're washing your hair every day or more, it may be better to choose a mild shampoo instead of a shampoo designed for oily hair. For some people — especially people with fine, fragile, or combination hair (hair that's oily at the crown but dry on the ends) — shampoos for oily hair can be too harsh. If you have oily hair and want to use a conditioner, choose one that's made for oily hair. If your hair is dry, it's a good idea to wash it less frequently. Some people only need to wash their hair once a week — and that's fine. Many people who have curly hair also have dry hair. Curly and dry hair types are usually more fragile than straight hair, so you'll need to be especially careful about using heat styling products. Shampoos made for dry hair and hair conditioners can help. Your activity level and interests. Do you play sports or spend a lot of time at the beach? These kinds of things can affect your hair. For example, if you're an athlete with oily hair, you may want to wash your hair after working up a sweat during practice and games. But if you're a lifeguard or a swimmer, sun and saltwater (or the chlorine in pool water) can dry your hair out, no matter what your hair type. If you're exposed to sun, wind, or other elements, you may want to use a shampoo designed for dry hair or use a conditioner. It's also a good idea to wear a hat to protect your hair when you're outdoors. Your hairstyle. 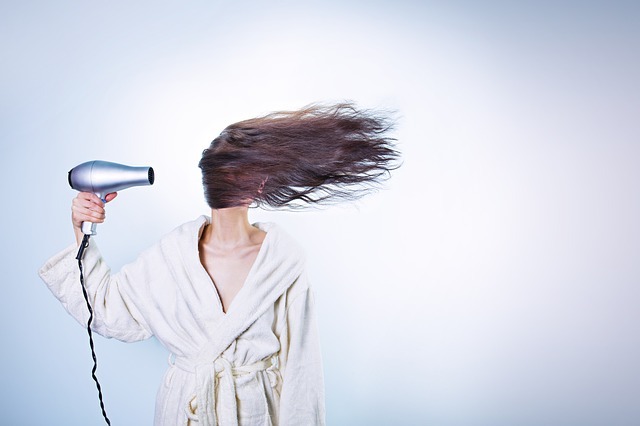 Heat styling products like curling and straightening irons can dry out even oily hair if they're used too much. Follow the instructions carefully, and don't use them on wet hair or high settings, and give your hair a vacation from styling once in a while. Ask your hair stylist or dermatologist for advice on using heat styling products. Chemical treatments can also harm hair if they're not used properly. If you decide you want a chemical treatment to color, straighten, or curl your hair, it's best to trust the job to professionals. Stylists who are trained in applying chemicals to hair will be able to evaluate your hair type and decide which chemicals will work best for you. Relaxers (straighteners) work by breaking chemical bonds in curly hair. Relaxers containing lye can cause skin irritation and hair breakage. Although "no lye" relaxers may cause less irritation, both types of relaxers can cause problems if they are used in the wrong way (for example, if they're mixed incorrectly or left on the hair for too long). Scratching, brushing, or combing your hair right before a chemical relaxing treatment can increase these risks. And don't use relaxers — or any hair treatment — if your scalp is irritated. If you decide to keep straightening your hair, you'll need to wait at least 6 weeks before your next treatment. That gives your hair a chance to grow enough so you can straighten just the new growth, without touching hair that’s already been straightened. Putting more chemicals on hair that’s already been straightened can really damage your hair. Relaxers can cause hair breakage when used over a period of time, even when they're used properly. Using blow-dryers, curling or straightening irons, or color on chemically relaxed hair can also increase the risk of damage. There are two types of color: permanent (which means the color stays in your hair until it grows out) and semi-permanent (the color washes out after a while). Some semi-permanent coloring treatments, like henna, are fairly safe and easy to use at home. Some people get a condition called contact dermatitis (an allergic reaction with a rash) from henna and other "natural" products, so be sure to test a small area first. Regular haircuts are one of the best ways to help keep hair healthy. Even if you have long hair or you're trying to grow your hair, a haircut can help protect the ends of your hair from splitting and damage. In fact, cutting may actually help your hair grow better because it's healthy and not breaking off. Dandruff — or flakes of dead skin — can be noticeable in a person's hair and on clothing. No one really knows what causes dandruff, although studies seem to show that it may be caused by a type of fungus or an irritation. Dandruff isn't contagious or dangerous. Over-the-counter shampoos containing salicylic acid, zinc, tars, or selenium sulfide can reduce dandruff flakes. When shampooing, massage your scalp (but don't scratch) for at least 5 minutes, loosening the flakes with your fingers. Rinse your hair well after washing. If your dandruff doesn't improve, see your doctor. He or she may prescribe a prescription shampoo and possibly a lotion or liquid to rub into your scalp. Read: Top Tips on How to Control/Prevent Hair Fall and How to Treat Dandruff? Hair can break when points in the hair thicken or weaken. Sometimes this happens near the scalp so a person's hair never grows very long. When hairs break at the ends, they're called "split ends," and the splits can travel up the hair shaft. Sometimes hair breakage and dry, brittle hair are signs of a medical problem, such as hypothyroidism or an eating disorder. If your hair is breaking even though you don't treat it with chemicals or other styling products, see a doctor. It's normal for everyone to lose some hair. In fact, we lose about 100 hairs each day as old hairs fall out and are replaced with new ones. With hair loss, though, hair thins at a rate that can't be replaced. When hair falls out and isn't replaced by new hair, a person can become bald or have bald patches. Hair loss can be temporary or permanent, depending on the cause. If changing your hairstyle or other treatment doesn't help, see a doctor. He or she may prescribe a drug to slow or stop hair loss and to help hair grow.